More than 900,000 people rely on City of Austin services like housing or financial assistance, emergency medical help, and relief from the heat in one of the City's public pools. I work with City staff and a collaborative team of researchers, designers, developers, product leads, and content strategists to build adaptable digital services than can grow and evolve with Austin residents. Once the site was launched, several City staff assumed maintenance of the technical infrastructure and site content. Basic updates were diligently installed and new pages and design elements were added by request. A decade later, the site is still standing, visited by over six thousand users a day. That said, it hasn’t seen any substantial improvements since its initial launch, and now lags behind user expectations — those of the public as well as City staff. Early on in our discovery, we knew we needed to change our approach to technology and start with what our teams needed: get better at supporting the people who are supporting our residents. We introduced this concept by doing it ourselves, sharing each step, inviting people to work with us, and with good documentation which you'll see below. I led research to determine gaps in Austin digital services starting with city staff who are responsible for managing austintexas.gov. Each person showed us how they created and published content to the website, shared success stories where a piece of software had completely replaced their paper workflows, as well as frustrating experiences with failed technology, implementation, or choosing a tool that overwhelmed their teams. 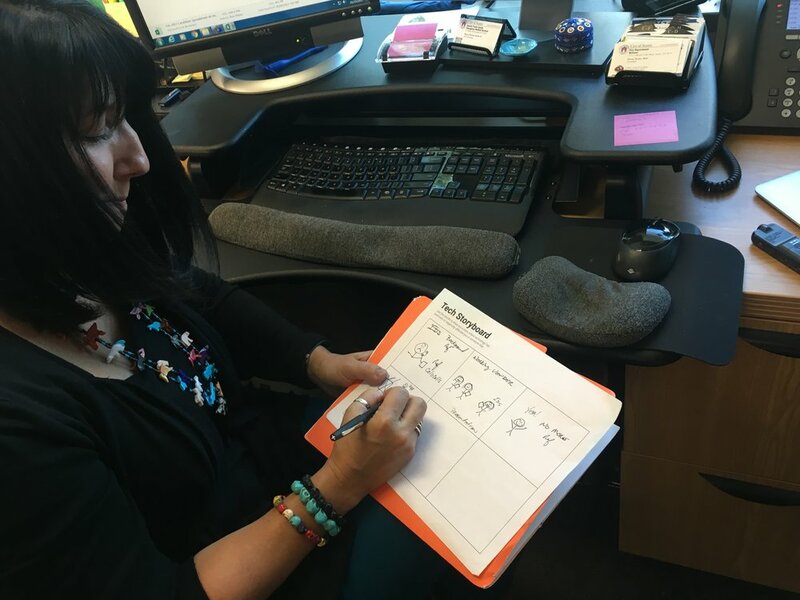 I worked with two team leads to document those experiences in a journey map that helped our team and advisors to focus our energy on opportunity areas. Each lightning bolt represents an opportunity to improve our ability to evaluate and design for user need, and to procure and implement technology. 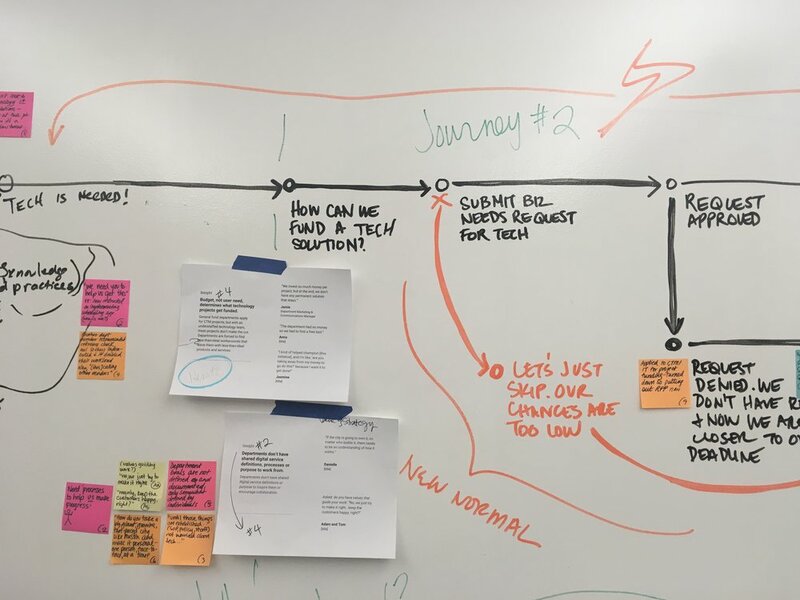 Our interviews and observations provided rich insights that we transformed into four key project areas that would help us to begin to shift our approach to digital services and build a more adaptable website. Define shared digital service values that help city teams align around what's important and focus on what to tackle first. We currently prioritize technology procurement around city business needs and need to shift procurement towards resident needs. Deliver city services that have been tested with residents and train city teams to write for residents, not for government. Build a flexible city website using iterative methods, and avoid vendor partnerships that don't adapt to user needs. Working with our advisors, a group made up of subject matter experts, managers, and city leaders–we wrote down every hope and desire for future digital services. I grouped them into patterns, labeled those groupings, and got feedback from program leads before sharing them with the advisors. Read our digital service values here. My team took on designing the user experience of a new City of Austin website as well as the supporting Content Management System which enables city staff to put information (content) and photos onto the website. The website focuses on the resident as the primary user while the content management system focuses on city staff. Most of the content creators we interviewed had a unique workflow–figuring things out as they go and investing time to create their own systems so they could manage content across their department. One of the greatest challenges we observed was a lack of confidence. For content creators who are less tech-savvy or who rarely need to update content, they are relearning the system every time they use it and afraid to make mistakes. 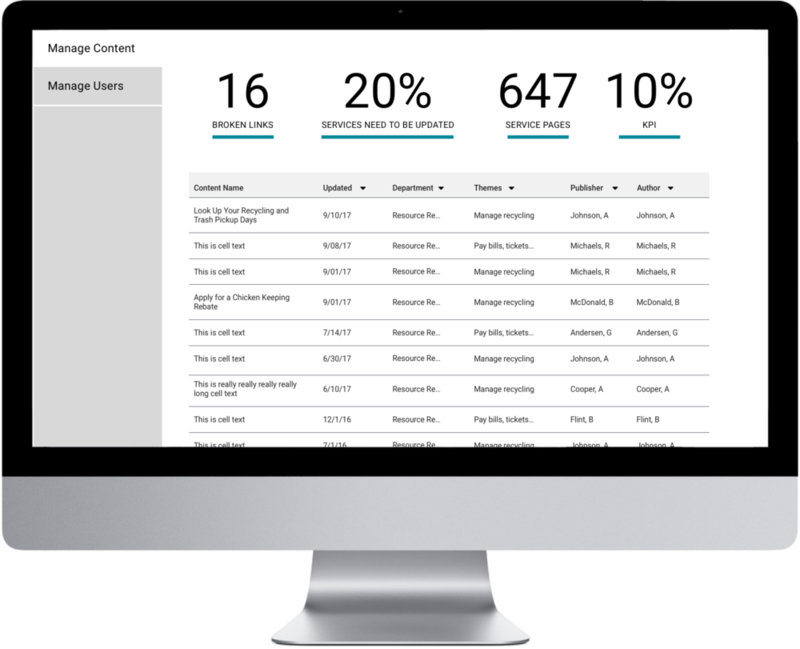 We designed, tested, and refined the content creation user flow as well as content management tools. First, we learned that most city staff use desktop computers to draft and edit austintexas.gov content. There's a mismatch here with resident users who primarily use mobile devices to access austintexas.gov, 51% mobile (a low number compared to other cities) vs. 49% desktop and other device sizes. 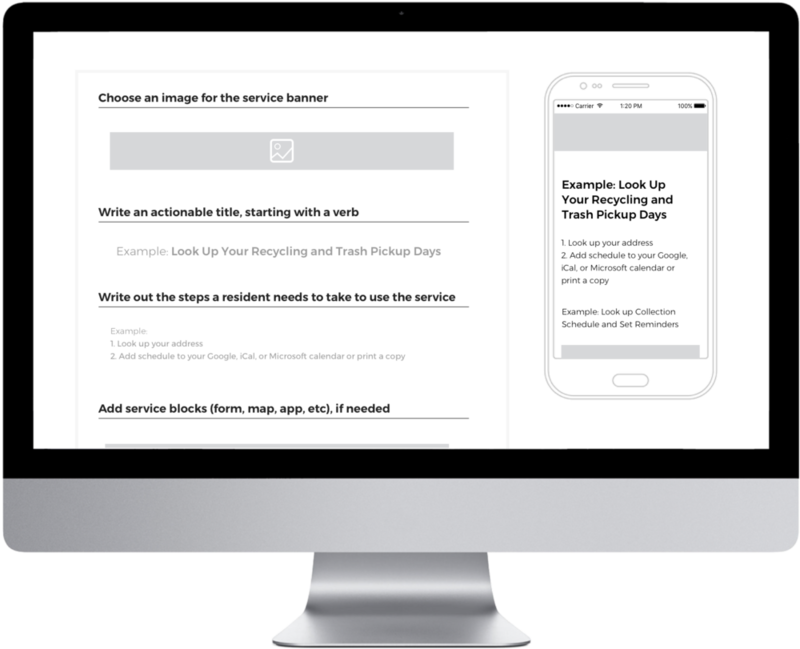 We included a mobile preview as part of the content creation form so that, no matter their device–content creators will always be able to see what their service will look like to residents. Next, City of Austin authors have a dashboard but some of the columns aren't formatted well, blocking users from sorting, filtering and evaluating their content. There's also other tools–analytics and content update notifications that haven't been available to city teams. We worked these features into the new design and will be able to test and refine them over time, based on our observation of how content creators use the metrics. One more design feature is the warmth and fun that we worked into the system. We added fist pumps to the publish confirmation screen so that users feel they've followed the steps, produced good content, and got all the way to publish. The playful design lends itself to expert users of the system, too. We tested each flow with content creators and refined it before beginning to work with our development team to groom user stories and evaluate existing content management systems like Drupal 8, Netlify, Wordpress, and Wagtail. We visited a digital literacy class, coffee shop, and age 55 and up job fair to test prototypes of a new city website and the information architecture. Above you see a man using the clickable prototype on a smartphone, a device he's never owned. We got great feedback because of the lack of familiarity with mobile devices in the digital literacy class. At right, a resident sorts city services into categories, revealing his natural organizational patterns. This activity is called card sorting and proved invaluable in shaping the information architecture of our website MVP, and best of all–gave us insight into people's lives and needs. In terms of design, many cities organize their content according to the organization itself–putting services like 'Getting Financial Assistance' under the department section that manages that service, and assuming that people use the website beginning with the homepage and moving forward. We know, based on observations and analytics and from conversations with other cities who are ahead of us in this work, that when a person needs something they use a search engine like Google to find it. For a city website, that means they are rarely interacting with the homepage, rather they're jumping into the site onto the (hopefully) service they need and then moving around to related services. We analyzed content relationships across several city and private organization websites. Mass.gov's shows how someone enters on a Topic page, maybe to learn about college tuition assistance in Massachusetts, then they move to a related Topic then drill down into a Service, like 'Registering a child for summer camp'. How-to's and Service Detail pages are where people fill out forms, review maps, or learn the extra information they need to accomplish a task. We introduced two new concepts to guide the Austin.gov user experience. Service-oriented Language: coaching content creators and other city teams how to write for residents versus at them. Avoid major digital content writing pitfalls like writing for a graduate reading level or putting seasonal content in red, a color that conveys a sense of urgency and is hard to read my many people. You can see notes in our digital style guide. Next, write using actionable phrases that let the resident know what they can do with this service, form, or map. Example above on looking up your schedule. Services becomes the entry point for residents who, based on our observations, aren't aware of many of the services the City of Austin offers. Focusing on content relationships strengthens their chances of getting to services they need and services they need that they never knew existed. Topics are buckets of services, such as 'Manage Recycling, Trash, Energy, and Water' that reflect people's natural organization patterns. Themes are the biggest buckets of information, connecting topics to a larger subject, like 'Living in Austin'. Austin.gov is a work in progress. Our goal is to launch the initial site with a handful of services in 2018 and continue to build from there. Please check back for updates and follow us on Medium! The work shared above reflects our collaboration beginning in May, 2017.